Brandnew full length Album, OUT NOW! THE RAYMEN emerged with their back-from-the-grave, swamp-blues meets death-country and psychobilly sound in 1985, debuting on their Going Down To Death Valley album. Desert Drive and their double LP, From the Trashcan To the Ballroom followed the next two years. Song themes run the gamut from werewolves, to voodoo, ‘50’s horror B-movies, trains, switchblades, witchdoctors, Lucifer, outer space and fast cars. Oh, yeah, and the perennial trouble with dames. Hoodoo you love? One constant in the band and its direction over, low, these many decades, has been head Rayman, and lead singer and songwriter, Hank Ray. 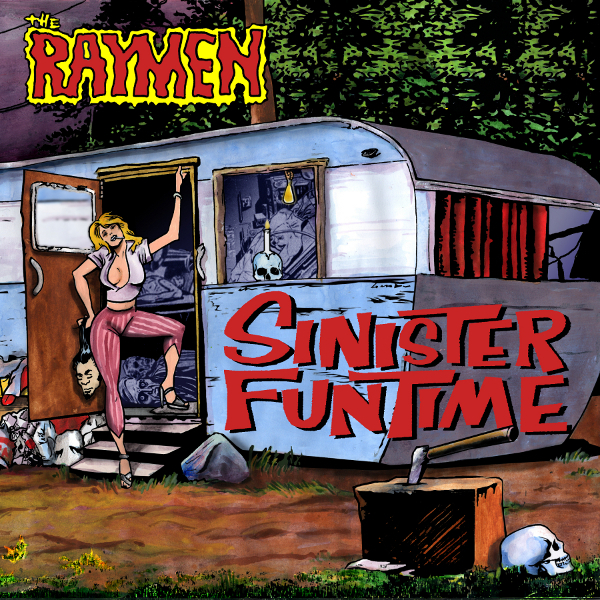 With 15 albums and appearances on numerous compilations over the years, the Berlin based RAYMEN return in top form with their latest release, Sinister Funtime. ‘Funtime’ is a rockin’ brain-stomper that gives no quarter, and is an instant refresher course in what rock and roll is all about in the first place. Hank is recognized as the Godfather of Death Country Rock, following a Goth C&W style of his own. On ‘Funtime’ he dials up the energy to recapture the dark ju-ju and fury that made the THE RAYMEN one of the top cult bands in the genre. Hank’s distinctive, rugged baritone imparts an ominous tone to the songs, adding an extra dimension of menace and boding evil to the music. THE RAYMEN are scorching up the tracks again, playing to beat the very Devil they sold their souls to, all those years ago. The album fairly drips with blood, snake venom, graveyard mud and reeking of sulphur, insuring a very sinister, but fun time for all who climb on board Death’s black train. All ‘board! LOOKING FOR THE REAL DEAL? AND CHECK BACK FOR SHIPPING COSTS! LOOKING FORWARD TO HEARING FROM YOU, CATS!!! This page has been viewed 3,622 times.